Need a guide to help you nurture young writers in your house? 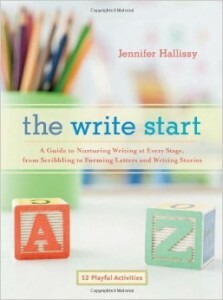 The Write Start by Jennifer Hallissy, a pediatric occupational therapist, is a wonderful resource, which offers parents not only an explanation of the path to writing readiness, but it also details 52 creative activities to assist help children of all ages with developing the skills they need to succeed. Separated into Scribblers, Spellers, Storytellers, and Scholars, Hallissy provides parents with the information they need to raise confident writers. Hallissy explains, “Thinking and learning are not one and the same. Thinking is a passive pursuit; learning is active.” And, according to Hallissy, “Writing is thought in action,” as it offers children the opportunity to make knowledge their own. So Hallissy explains to parents what they need to know at each stage of writing – scribbler, speller, storyteller, and scholar – and then offers the proactive parent tips on guiding young writers at every stage. Hallissy also outlines the tools, materials, and spaces that promote writing. For example, Hallissy points out how parents are often quick to exhibit art work but neglect to decorate with “print.” I’ve been teaching English for over twenty years, and while I’ve hung up my children’s writing on our frig, I’ve never thought to permanently display it. I’m already sizing up where I might hang something on the wall. Table Talk – Did you know there is such a thing as chalk cloth? I didn’t. But I love Hallissy’s idea to create a tablecloth out of it so kids can perform everything from sketches to spelling to math calculations on it. Show-Me-the-Money Ledger – My nine year-old definitely needs to keep a piggy-bank balance, as she squandered all her savings this past summer on Shopkins and was crushed when she realized what she’d done. Food for Thought – My thirteen year-old is always asking me, ‘What’s for dinner?’ She even created a mini menu board out of a picture frame (thanks to Pinterest) so she’d know, but I never got around filling it out. Guess who’s going to be in charge of that job from now on? 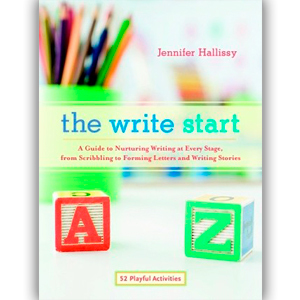 Hallissy reiterates what more and more research confirms, “Neglecting old-school writing education in favor of its high-tech counterpart is a serious mistake with far-reaching consequences.” So if you’re interested in engaging your child in the wonderful world of writing, then check out The Write Start by Jennifer Hallissy for just the right combination of fun and functional skills development.